Product #17424 | SKU 2200A II C | 0.0 (no ratings yet) Thanks for your rating! The 2200a II Cardioid Condenser Microphone from soe Electronics features a custom, handcrafted 1" gold-sputtered diaphragm. The microphone's black rubber paint finish helps to dampen chassis resonance. The soe 2200a II Cardioid also features a low cut filter and a 10 dB pad. 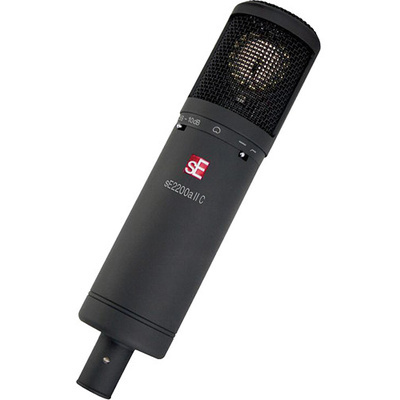 The soe 2200a II also comes with a universal, black shockmount and a pop filter. The soe 2200a II Cardioid is highly utilised in many professional studios, despite its modest price point. It has a wide frequency response and high SPL handling.